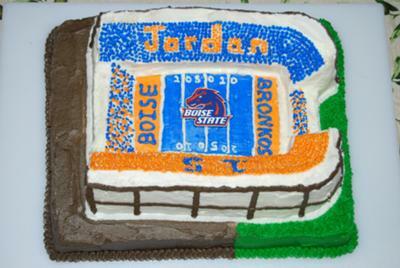 This Boise State football cake was for my grandson Jordan's 15th Birthday. The base was made from an 11x15 sheet cake. The stadium is a modified from a norticware stadium cake mold. The frosting is buttercream and all the decorations are piped on with various tips. The center piece is a key fob I purchased at Boise book store. I hope that you enjoy viewing this cake as much I enjoyed making it. Go Big Blue!! Lots of work!!!!!! But awesome!! !